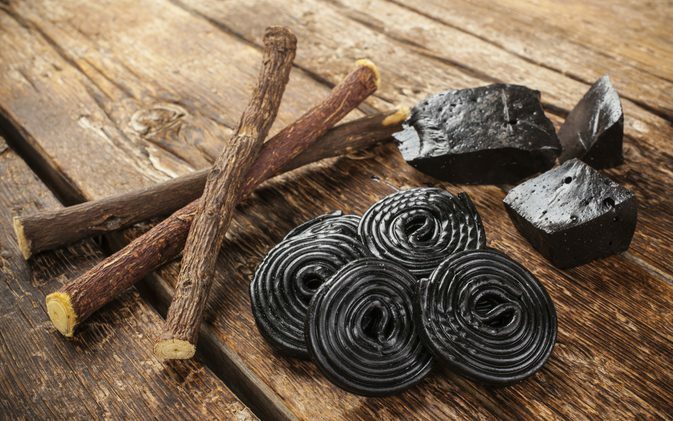 Believe it or not, much of the licorice sold in the United States is not actually made from the herb licorice at all. Most “licorice” candy sold in the US is flavored with anise, and does not have the medicinal properties of this medicinal herb. Licorice (Glycyrrhiza Glabra) is a plant native to southern Europe and some regions of Asia, and is part of the Leguminosae plant family. It is not related to anise or fennel, despite its similar flavor. Licorice extract comes from the plants’ roots and underground stems. The benefits of the licorice herb are many, but care must be take with licorice root as it contains glycyrrizin. Glycyrrizin is a compound in licorice root that can raise blood pressure while supporting adrenal function, and should only be used with the supervision of a knowledgeable practitioner. Another form of licorice, deglycyrrhizinated licorice extract or DGL, does not contain glycyrrizin and is safe to use. The deglycyrrhizinated form of licorice (DGL) can be used to relieve discomfort from chronic indigestion, heartburn, stomach ulcers and caker sores. Whole licorice extract can be beneficial for menstrual and menopausal disorders, as well as inflammatory disorders. Topical whole licorice is useful for herpes, eczema and psoriasis. Licorice is also used to relieve symptoms of the common cold and is a key ingredient in many over-the-counter cough syrups and lozenges. Licorice is available as dried roots, extracts, tinctures, tablets, extracts, and topical preparations. Deglycyrrhizinated licorice (DGL) is available in chewable tablets, wafers, capsules, tea, and powder. Licorice products that contain glycyrrhizin and whole licorice taken orally may affect the adrenal gland increasing the effects of corticosteroids, causing sodium and water retention and increase blood pressure, increase the effect of digitalis preparations, alter the effect of estrogens/progesterone, and decrease the effect of anti-hypertensive medications. Some animal studies have shown licorice decreases the metabolism rate of Warfarin, a blood-thinning medication, and it is not advisable to take licorice when on similar medication, or while taking diuretics. Excess intake of licorice may have a negative effect on potassium levels in the body. A high salt diet may worsen the adverse effects of licorice including water retention and hypertension. Avoid whole or licorice root if you have high blood pressure, kidney or liver disease, diabetes or heart disease, are pregnant or are breastfeeding. You should not take licorice root (with glycyrrizin) for longer than 6 weeks. DGL licorice on the other hand has not known side effect and is safe for long term use. For DGL products, there should be no glycyrrhizin. For other products, look for formulations with 6-10% glycyrrhizin. Follow dosage directions accompanying whole licorice products. If using DGL extract, take two tablets chewed slowly before or between meals or one half teaspoon of the powder at the same times. DGL powder can be made into a paste (swish in mouth for three minutes and spit) to treat mouth ulcers. DGL is a natural remedy for chronic indigestion and reflux and an effective alternative to medications such as proton pump inhibitors (PPIs) like omeprazole.